Women play a critical role in economic growth. Almost 85% of all purchasing decisions be it automobiles, home improvement products, consumer electronics, all are prompted by them. Their influence does not stop here; even small business industry is incredibly influenced. Women entrepreneurs are on the rise; the volume of loan requests is rocketing. They generate more than $1.6 trillion in revenue. 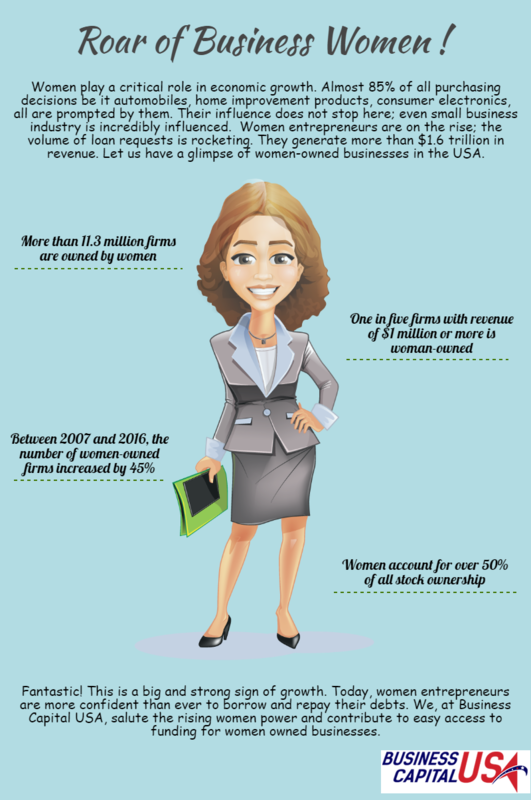 Let us have a glimpse of women-owned businesses in the USA. More than 11.3 million firms are owned by women. Between 2007 and 2016, the number of women-owned firms increased by 45%. Women account for over 50% of all stock ownership. The most women-owned businesses are Healthcare and social assistance. Fantastic! This is a big and strong sign of growth. Today, women entrepreneurs are more confident than ever to borrow and repay their debts. We, at Business Capital USA, salute the rising women power and contribute to easy access to funding for women-owned businesses.